Ultraviolet systems work in two ways. Its primary action is to destroy microorganisms, bacteria, viruses, algea, moulds and their spores, drastically reducing the risk of infection to bathers. Our UV systems also initiate photochemical and photo-oxidation reactions within the pool water, eliminating chloramines, the compounds responsible for the cause of ‘Red-Eye', skin irritations and ‘Chlorine smell'. Traditional look with inlet and outlet branches, flow range 100-4500 gpm, ANSI flange size 2"-14", 1.3kW-7.3kW medium pressure lamps, Includes temperature probe, UV monitor, automatic wiper system and full Spectra control panel. 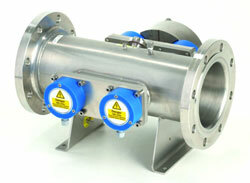 State-of-the-art design offering vertical or horizontal installation, flow range 560 - 4800 gpm. 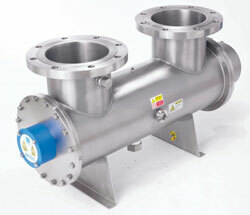 Multiple lamp medium pressure 1.5kW-3.3kW lamps, ANSI flange size 6"-14" (larger custom models available). Simple, easy to read display, Includes temperature probe, UV monitor & automatic wiper system. Significantly reduced installation and service area. 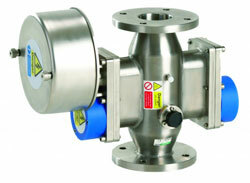 Small, compact ( only 12" overall length) and economical, Flow range 30 - 176 gpm, 1.0kW-1.3kW medium pressure lamp, ANSI flange size 2 1/2"-3", 316L SS Chamber, Simple, easy to read NOVA led display, Includes temperature probe, UV monitor, automatic wiper system & half power operation. Also available upon request with full Spectra control system. Single phase power requirements.